Jackson, New Hampshire is the cross country mecca of the East. 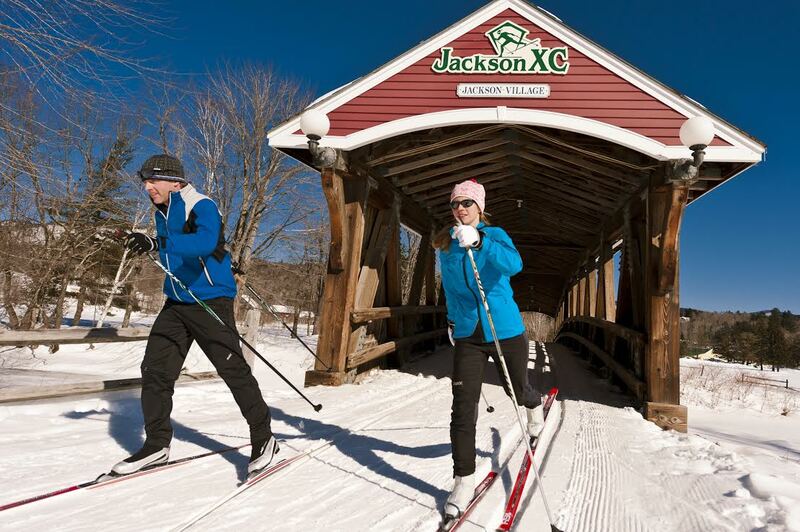 What’s the Backstory: Jackson, New Hampshire is where Currier & Ives meets winter sports. The town has a bevy of country inns and some of the best and most extensive cross country trails in the East. New ski, snowshoe and stay packages make it affordable to stay. What’s the Deal: Ski from the doorstep of the Riverwood Inn in the heart of Jackson Village with their “Ski Free” Package. Two-night rates start at $125 during non-holiday weekday periods and include two Jackson Ski Touring trail passes. A Sunday through Thursday non-holiday weeknight package is also available, with four nights for the price of three. This package includes two trail passes, two snowshoe passes and use of the Yellow Barn for secure ski storage and tune-ups. The Christmas Farm Inn and Spa’s Family Ski Adventure Package gives parents and children an opportunity to enjoy more than 100 km of trails together, a full American breakfast, afternoon tea and cookies and access to the inn’s indoor pool, hot tub and fitness center. Midweek, two-night rates start at $258 (based on a family of four) in a traditional inn room. Snowshoers can take advantage of two packages offered the Inn at Ellis River for Two Night Midweek or Weekend Snowshoe Nature Tour Packages (January-March). The midweek package starts at $289 for a classic room, $349 for a fireplace room and $439 for a room with a Jacuzzi tub. Included in both packages are two nights lodging, gourmet country breakfasts, afternoon refreshments, one evening candlelight dinner at a local restaurant, a snowshoe tour and one-day snowshoe rentals for two. Weekend packages start at $389 for classic rooms, $469 for fireplace rooms and $509 for rooms with a Jacuzzi tub. Taxes and trail passes (except for the tour) are extra. Novice skiers can take advantage of the Wentworth Inn’s Ultimate Learn to Cross Country Ski Package. This package includes two night accommodations in a deluxe room complete with a private outdoor hot tub, a four course candlelight dinner, full country breakfast and everything you need for a day of cross country skiing: lesson, equipment and a full day pass. After skiing, soothe muscles with a couples massage and enjoy Swiss fondue for two in the Après Ski lounge. The Wentworth package starts at $502 for two guests. Additional ski, snowshoe and stay packages are available at Whitney’s Inn, the Inn at Jackson, Wildcat Inn and Tavern and Eagle Mountain House.